Goalkeeper Nick Pope says that Europa League football would be ‘perfect’ for the Clarets after another point in the Premier League all but secured the club’s passage. 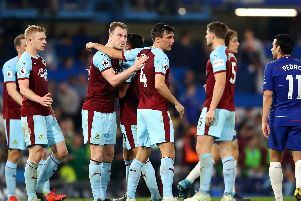 Barring a 15-goal swing, with Everton also needing to claw back six points with a couple of games remaining, Burnley will likely enter the competition at the second qualifying round stage, with the draw held in Nyon on June 19th. After the 25-year-old kept his 12th clean sheet of the season in the top flight following a second goalless draw with Brighton, he said: “We’ve got to go in to the next game with the same attitude and get it over the line for sure but we’re in a great position. We’ll look to take that forward after getting another point on the board and move on. “Let’s wait and see until it’s nailed on. If you celebrate and it doesn’t happen then you’re left with egg on your face. It’s important for us to get it over the line. Pope, who earned his first international call up this term, is looking forward to testing himself in a new environment and bolstering his CV with the addition of European football. And it’s a challenge that the former Charlton Athletic stopper believes the squad will take on and learn from. “Our story has got to be right up there,” he said. “Everybody knows about our budget and the size of the club. We’ve punched well above our weight and we deserve to be where we are. “I think we’ll take the challenge on and it will be a different challenge for all the players who haven’t played European football. “It’s a challenge that everyone wants to take on, everybody is keen for it, it’s not a bad thing at all. “You want to test yourself at the highest level so that will provide myself, the team and the gaffer with the chance to do that. “There are things that we’ll probably learn and that will help us grow again as players and as a team.